At some point, many php developers turn to the pcntl functions in php to write a daemon, or server, or simulate threading. Any calls to die() or exit() will end the test prematurely. The call to sleep(1) will take 1 second of wall time in the test. That can add up quickly if you have lots of test cases. There isn’t a reliable way to make fork() return -1 to test the error handling branch of the code. We need to engage some black arts php extensions to make this happen. An installation guide follows, and the post ends with a complete listing of the unit test. These extensions are meant for testing. These are for your dev or test servers. Please do not install these on your production servers unless you’re really positive that you want to have them available in your production environment! First we’ll need the test_helpers.so extension. This will let you substitute a callback for any calls to die or exit. And when you type php -m at the command line, you should see “test_helpers” listed as a Zend Module and a PHP Module. I will skip the guided tour of the evolution of this unit test and jump straight to the finished product. 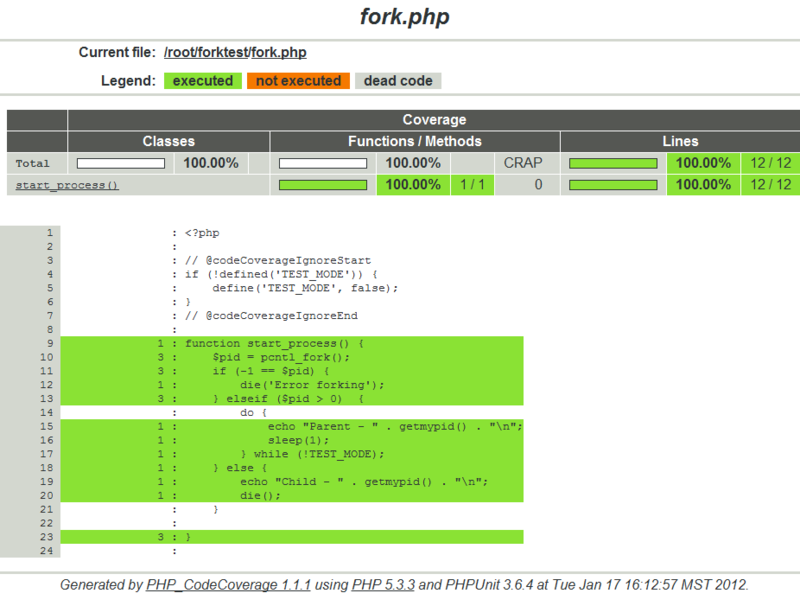 Here’s a full unit test of the forking code above with 100% coverage. Note: In the original file, there are ignore coverage wrappers around the code that turns off test mode. Usually this flag is not in a conditional block, it’s set by the application’s framework and is based on the environment + configuration file. To keep things simple, I’ve chosen to demonstrate this method using a constant. I saw VisualPHPUnit and was immediately interested. This provided a very nice visual wrapper to PHPUnit without full blown continuous integration, and kept a history of your test passes / fails. VisualPHPUnit is a wrapper for PHPUnit. 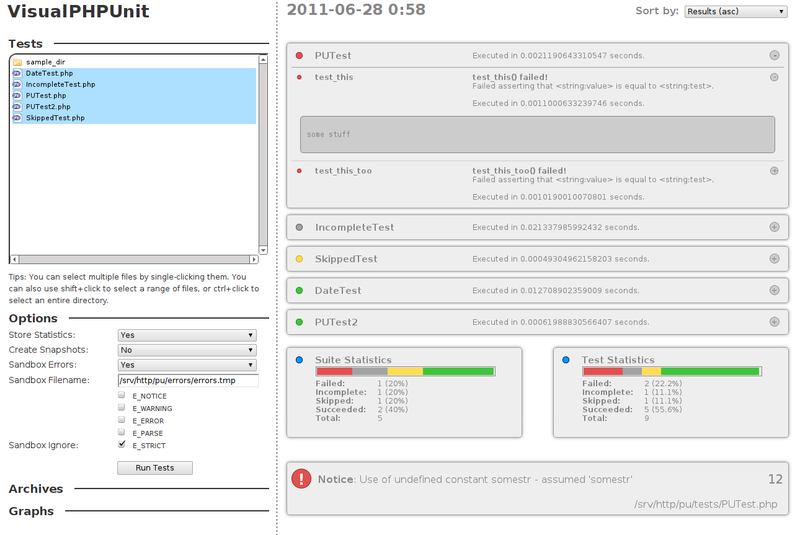 It expects that your tests are compatible with PHPUnit’s command line test runner already. Could this work with WordPress’ Unit Tests? After some investigation, I’m sad to report that, no, it can’t. VisualPHPUnit makes several assumptions that are incompatible with WordPress’ test suite. These are not bad assumptions, just incompatible ones. Include the bootstrap before the PHPUnit library. This causes problems because the bootstrap cannot reference PHPUnit (e.g. extending PHPUnit_Framework_TestCase). Each test case (a class) is assumed to be in a single file, and named accordingly. WordPress sometimes groups multiple test cases together in a single file. A good example of this is test_includes_formatting.php. Why don’t I submit these issues to VisualPHPUnit? These aren’t bugs. They are incompatibilities between how VisualPHPUnit expects things to be done, and how WordPress’ Unit Test do things. Changing these items in VisualPHPUnit could break compatibility with other projects. Why don’t WordPress’ unit tests conform to PHPUnit’s structure? WordPress was also released in 2003, which was before test-driven-development really took off in the php world. Having a testable app requires a certain design. Also, WordPress wasn’t written from scratch. WordPress started as a fork of B2/cafelog. It wasn’t a greenfield design. Why doesn’t WordPress just fix their unit tests now? The core dev team wants a more testable app, and they are working to retrofit unit tests into WordPress, but this is a big challenge. There are situations in WordPress which are difficult to test, but work perfectly fine. The dev team is left with a difficult choice: Rewrite a functioning piece of code to be more testable, but possibly introduce new bugs, or leave it alone and put off a new test framework a little longer. You can actually see some discussion about this on ticket 17749.